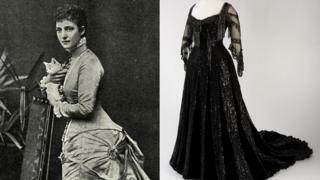 A missing black dress worn by Queen Alexandra has been discovered in an attic and given to a museum in Bath. Its existence was discovered after owner Francesca Counsell Risius got in touch with the city's Fashion Museum. It is understood it was bought as a royal curiosity for her great aunt's shop in Tunbridge Wells in the 1950s. Embellished with beads and sequins, the evening dress was designed for the fashion-conscious queen by London dressmaker Barolet. Dating from the early 1900s, it also boasts her signature black and gold name tag sewn into the waist tape. Alexandra of Denmark was born Princess Alexandra Caroline Mary Charlotte Louisa Julia in 1844. She and Albert Edward, Prince of Wales, were married in 1863 and had six children including the future King George V.
In January 1901, her mother-in-law Queen Victoria died and Edward succeeded to the throne as Edward VII and she as Queen Consort. As well as being a 19th Century fashion icon she was also the first president of The British Red Cross. Ms Counsell Risius said it was her great aunt's prized possession. "She gave me the dress in the late 1960s and I've kept it in a box ever since," she said. "I've carefully tried it on a couple of times, so has my daughter and occasionally we've taken it out of its tissue paper to show interested friends and family." Dress historian Dr Kate Strasdin, who verified its authenticity, said she was "delighted" by the discovery. "This dress is a fabulous find, not just because of its beauty, but because of what the dress reveals about Alexandra's fashion choices," she said. "Placing orders with smaller, less well-known dressmakers such as Barolet shows a measure of Alexandra's determination to dress apart from her peers." After her death in 1925, much of Queen Alexandra's wardrobe was sold and many pieces are still missing. In the 1960s her tartan silk dress was discovered in a vintage shop in London. Both dresses are now on display until next April at the Fashion Museum Bath.